The Atlanta legend explains how a song he sat on for two years became an enduring No. 1 hit. During the recording of Speakerboxxx/The Love Below, Outkast's seminal 2003 double album, Big Boi and André 3000 were each holed up in different rooms in Atlanta's Stankonia Studios. "After 'Dre did "Hey Ya," I said, "We're not finna do nothing regular,'" Big Boi remembered during a recent visit to The FADER. "The Way You Move," the lead single from his Speakerboxxx side of the record, perfectly captured the Atlanta rapper's smooth delivery and became a timeless hit. As Big Boi explained, he had been sitting on the Carl Mo instrumental that would become his No. 1 single. "I knew the song was a hit when I first heard the bare-bones track," he said. "That's why I marinated on it for a couple years." 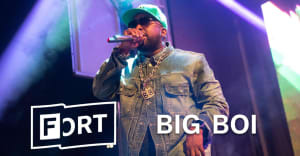 In the video above, Big Boi recalls how the layers of the track came together, his vision for the video, and Fonzworth Bentley's memorable cameo.